As a dentistry operated by a husband-and-wife team, we understand the importance of family. To keep your family’s smile healthy and happy, it’s important for each member to receive adequate dental care. Proper dental care can ensure greater oral health, more cost-effective visits, and, most importantly, a fully functional smile for each individual family member. Children’s teeth have several complexities and differences compared to adult’s teeth because they are still developing. This developing period is a sensitive stage for your children’s teeth that requires attentive care. At Echeverri Dental Center, our experienced staff will make sure your child’s teeth are developing correctly and will work to avoid any potential dental issues. Going to the dentist shouldn’t be scary or intimidating! Our talented team strives to make our office a warm, inviting, kid-friendly environment. We want both you and your child to feel comfortable and relaxed while at Echeverri Dental Center. We offer services in both English and Spanish to make your child’s dental appointment more pleasant and familiar for them. Preventative Care: We will help teach your child proper dental hygiene techniques that can ensure a healthier smile. We’ll show them how to brush and floss properly and give them some fun tips about how to keep their mouth in tip-top shape! Teeth Cleanings: Teeth cleanings are imperative to good dental health. Our staff will remove built-up plaque and tartar from your child’s mouth to protect their developing teeth from tooth decay. Dental Frenectomies: In your mouth, there are two frenums. One frenum, known as the lingual frenum, is located between the base of the tongue and the bottom of the mouth. It helps restrict the movement of your tongue, so it doesn’t flop everywhere. Your other frenum, known as the labial frenum, connects your top gums to your upper lips. Sometimes, frenums cause oral difficulties, especially with children’s mouths. At Echeverri Dental Center, we can perform frenectomies to get your child’s mouth back on track. We also know that it can be hard to coordinate each family member’s availability. That’s why we strive to work around your timetable with flexible scheduling. We will do our best to schedule parents or siblings together to make dental appointments easier for you. 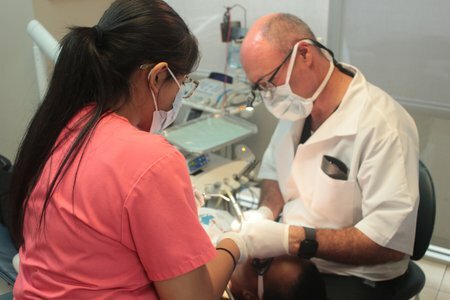 Visit Echeverri Dental Center for superb dental services. We look forward to working with you and your whole family! Call today to schedule an appointment!